angela is here... | sharing sights, sounds, and tastes. sharing sights, sounds, and tastes. The easy way to cut a mango! I originally posted this Vine video last summer and I think it’s probably the most popular post I’ve done to this day. Hope you enjoy this stop-motion on how to cut a mango! Please comment and let me know what other types of how-tos you’d like to see on Vine. Every time I go to Palm Springs, I always tell myself I’m going to order a date shake. It’s a sweet and creamy milkshake with lots of nutritional value that gets most of it’s flavor and sweetness from dates. Date shakes are synonymous with the Palm Springs and the surrounding desert area. Makes sense since dates have been growing there for over 100 years. Hard to believe the “Date Capital of the World” is just a two hour drive from Los Angeles. But if you can’t make that drive out to Palm Springs, you can make your own date shake at home. I actually made this one for breakfast the other day and it’s very easy to make – especially, if you have a Vitamix. The photo below shows you the ingredients I used – yes, just four ingredients! You can actually get away with three and make it vegan since the yogurt is optional. 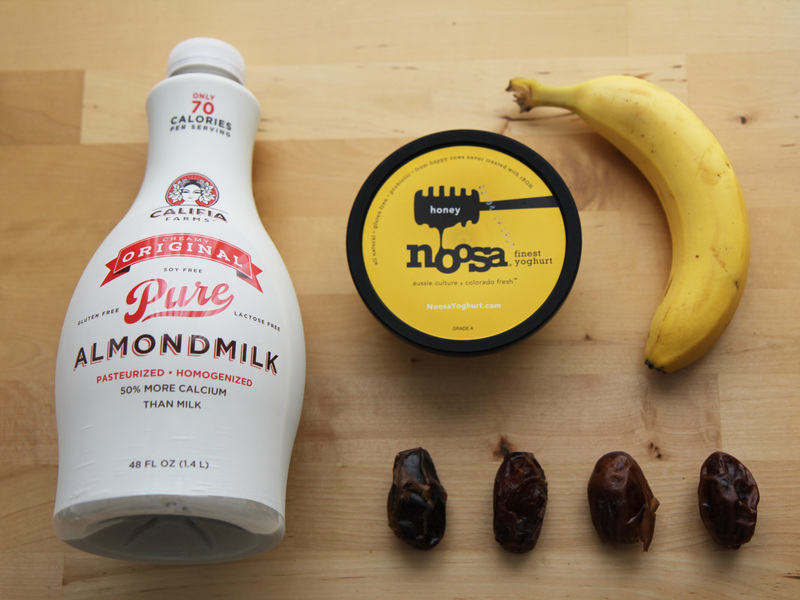 I wanted some tanginess with my date shake so I added some Noosa honey yogurt. When you have your ingredients, put it all into your mixer. I put mine in my Viamix and mixed on high for about 30 seconds. 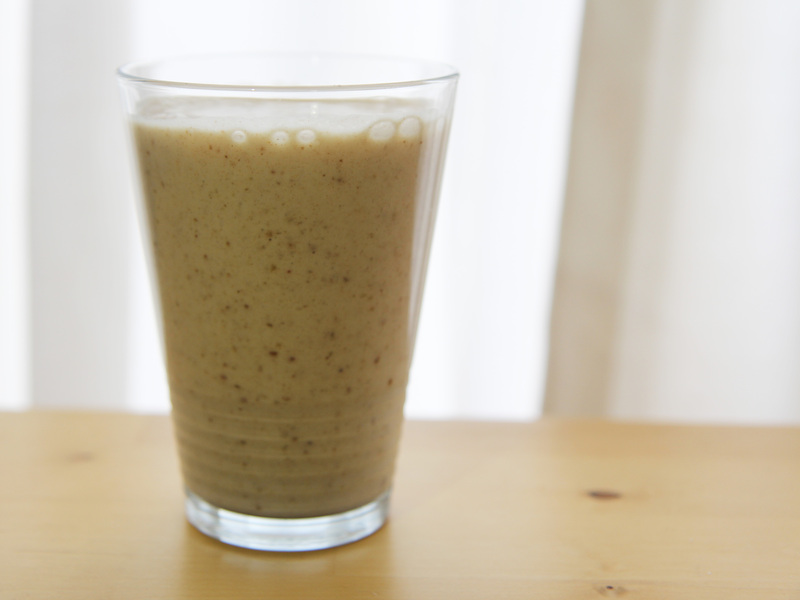 If you want your shake to be thicker, you can use a frozen banana and add 1/4 cup of ice. The result is a light and frothy shake that is less sugary than the recipes that use ice cream or gelato. Plus, it’s easy to make this vegan-friendly since the yogurt is optional and you’re using almond milk instead of regular milk. Low on cash but want to impress that special someone? I highly recommend grabbing a few tacos and drink from a taco truck in Echo Park (my truck of choice is Tacos Arizas on Sunset and Logan Street). 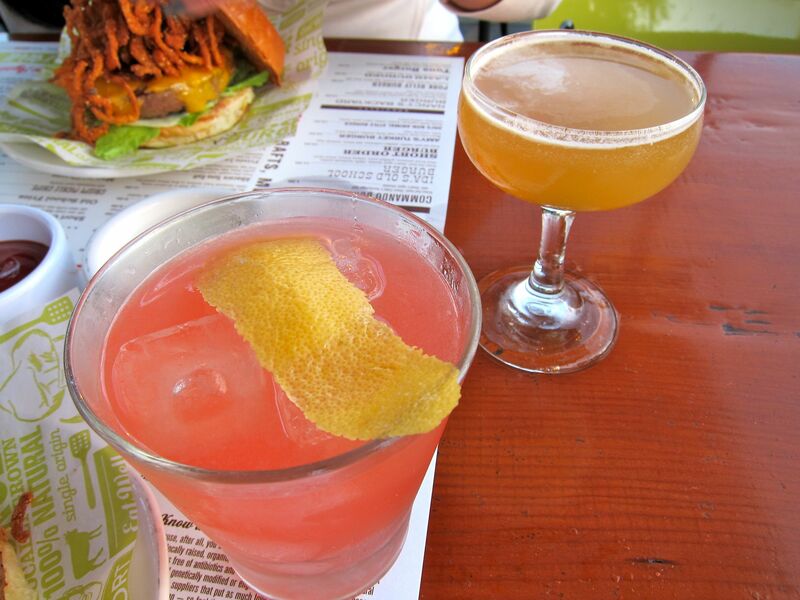 With food in hand, walk down Logan to Echo Park. Top: Echo Park at dusk. Bottom: Tacos from Tacos Arizas. Ever since the Echo Park reopened in June, there been new energy and life in the neighborhood. More people having picnics, kids on bikes – and the smell of delicious BBQ subtly making it’s way through the air. Plus, there are some great benches to sit and enjoy each other’s company. Happy date night! It’s not often you see a good dessert place open late in Los Angeles. True, on that strip of Beverly Blvd., you’ll come across Susina and Milk but not all of us can get ourselves to Mid-Wilshire. 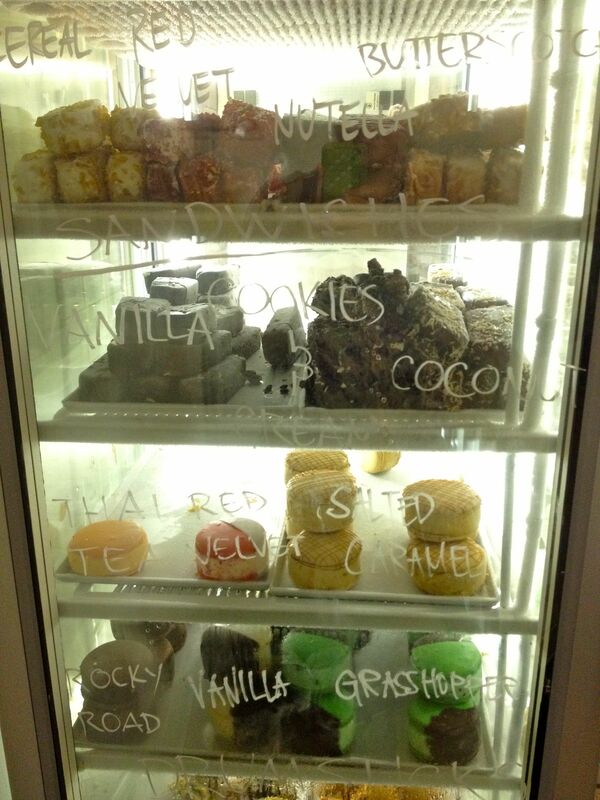 Luckily, if you live on the east side, Ramekin in Los Feliz is serving up some amazing ice cream and seasonal desserts. Best part is that they are open late (closes at 11:00pm on weekdays and at 1:00am on Friday and Saturday nights)! I first learned about Ramekin from my friend Gregory. He knows chef Jason Park who makes the delicious baked goods and homemade ice cream. Earlier this year, we were invited to the soft opening – it was truly a treat! We didn’t want to leave after the first round of tasting the desserts. 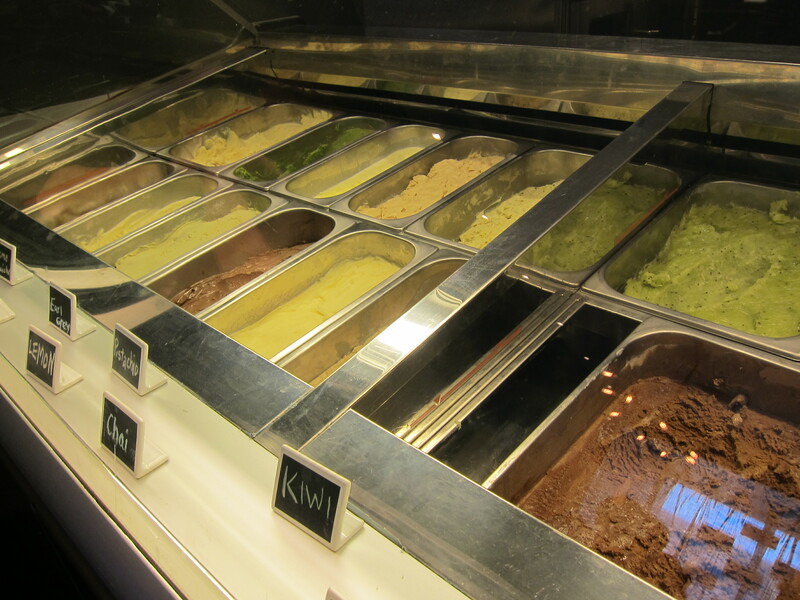 From seasonal ice creams (made in-house!) to panna cotta to seasonal tarts – all are served in ramekins. Homemade ice cream and sorbet at Ramekin. The menu changes seasonally and they get a lot of their ingredients from the local farmer’s markets like Hollywood and Santa Monica. There’s an emphasis in non-GMO ingredients and it feels good to talk to a chef who knows exactly where his ingredients are from and how it was grown. 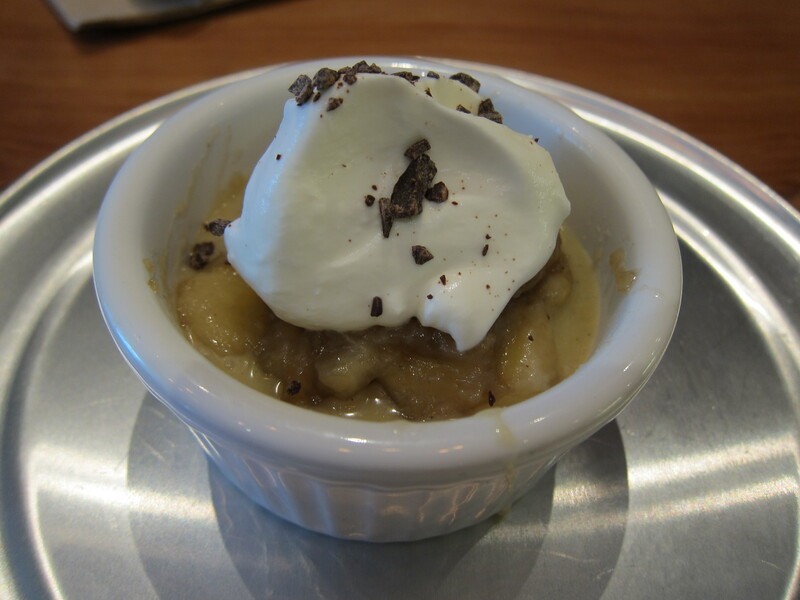 Banana cream pie at Ramekin. Since the opening of Ramekin, I’ve gone back countless times. The menu changes slightly because they use seasonal fruits. But one of my favorite desserts that I often crave is a standard on the menu: Chocolate bread pudding. It’s not your typical bread pudding so don’t try to compare. The toasted bread is hot and caramelized from being baked in the often. The smell is sweet and buttery. And to top it off, a scoop of Tahitian vanilla ice cream slowly melts into the crevices of the cubed bread. The first bite is the best – I get my spoon and dig straight into the ice cream — it’s important to get a little bit of ice cream, bread, and chocolate all on one spoon to get have the perfect first bite experience. What’s there not to love? Chocolate bread pudding at Ramekin. Pistachio ice cream at Ramekin. It’s great to see how this spot has become part of the Los Feliz neighorhood since it has been open. You’re saying “Duh, it’s in Los Feliz – of course it’s PART of the neighborhood.” But I’m talking about walking in to see people playing boardgames at the communal table with friends while drinking their Handsome coffee and having a cookie. 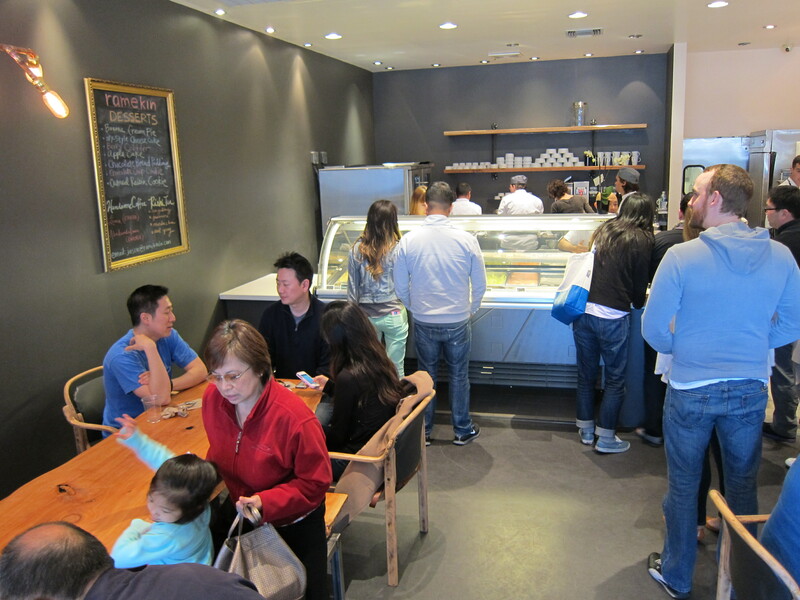 You see the Ramekin staff say hi to regulars as they come in to try their latest ice cream flavors. Indeed, these are all the things I saw when I was recently there. Looking forward to many more visits to Ramekin and seeing more people discover this sweet gem on the east side. My friends at the soft opening of Ramekin in February. We’re finally seeing a break in the heat wave in Los Angeles. Woohoo! 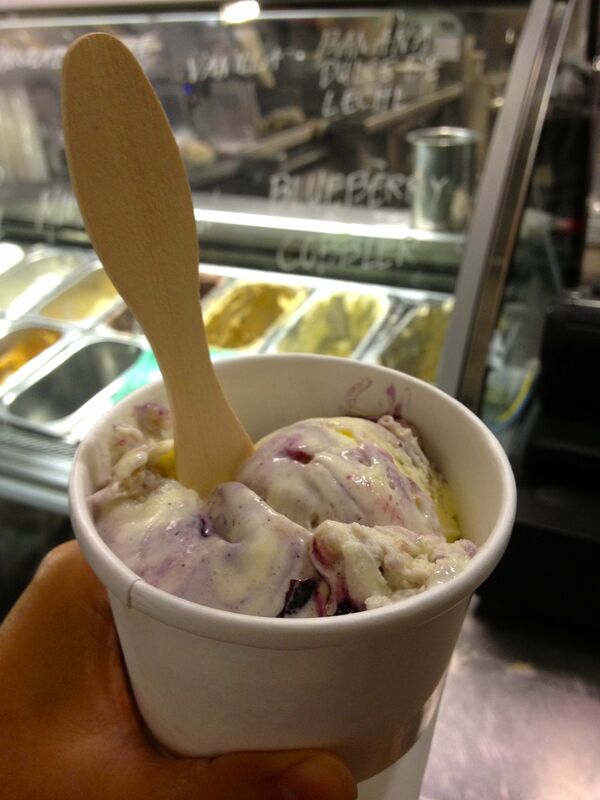 One reason why L.A.’s a good place to be when it’s hot are the cold treats. Here are a few of my favorite cold desserts that helped me stay cool this summer. First up, Milk. Located on the corner of Beverly and Poinsettia, this corner shop often has a line of people going out the front door. Who would blame them when you see the array of frozen treats in their fridge waiting for you. 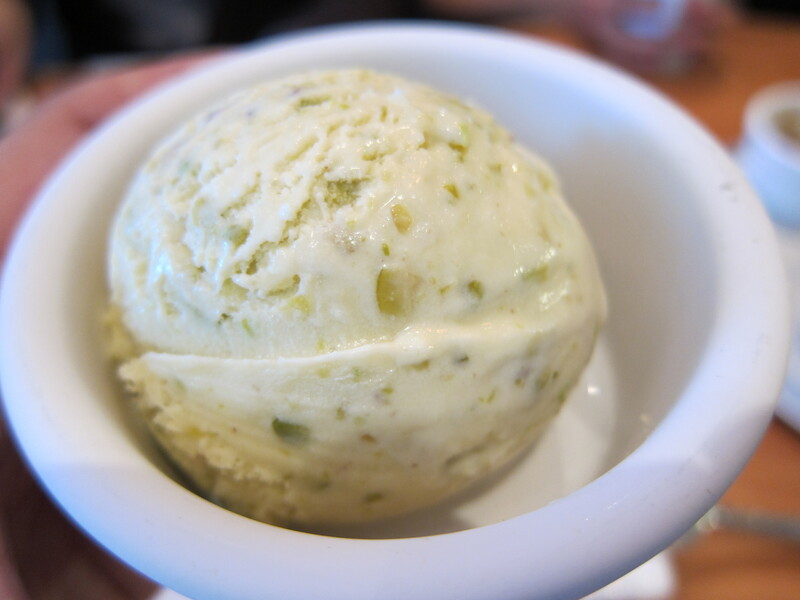 One of their popular ice cream desserts is the bright green Grasshopper. 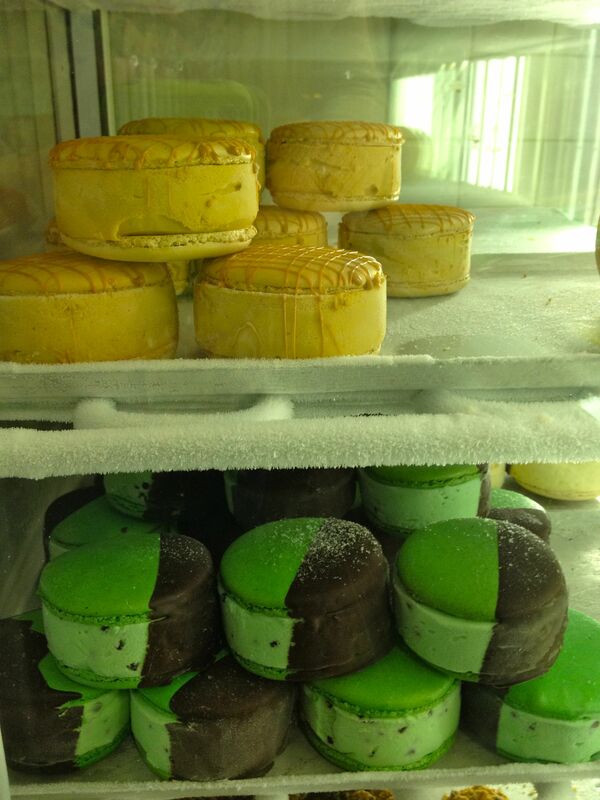 It’s mint chocolate chip ice cream sandwiched between two pistachio macaroon cookies and dipped in chocolate. How’s your sweet doing now? However, on my recent visit, I opted to get ice cream. You see, I have a weakness for blueberry pie and cobbler and when I saw they had an ice cream this particular day with blueberry cobbler ice cream, I had to get it. 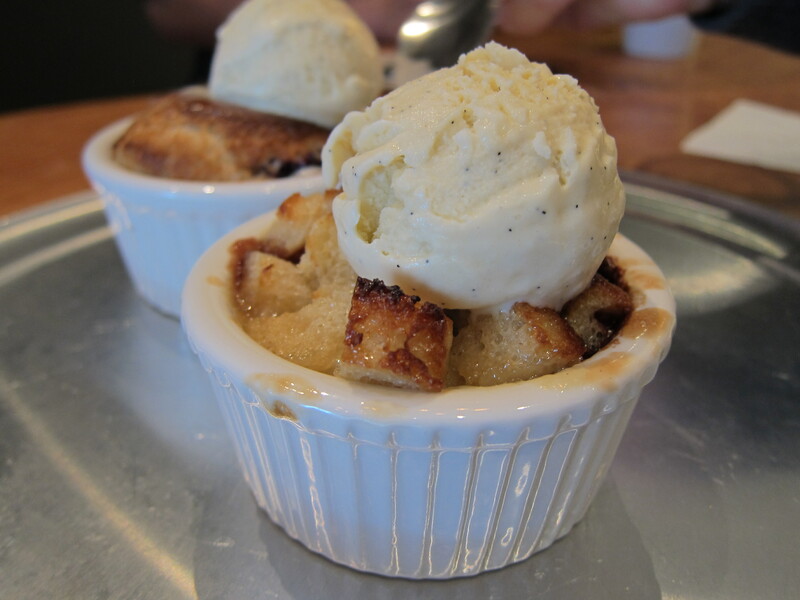 The ice cream was creamy and the bits of the cobbler crust added good texture. The best part was the abundance of blueberries swimming in the rich cream. When I’ve had blueberry ice cream before, there are usually few pieces of blueberry that look like raisins or the cream itself is infused with blueberry but there aren’t actually berries I can sink my teeth into. Well done, Milk! 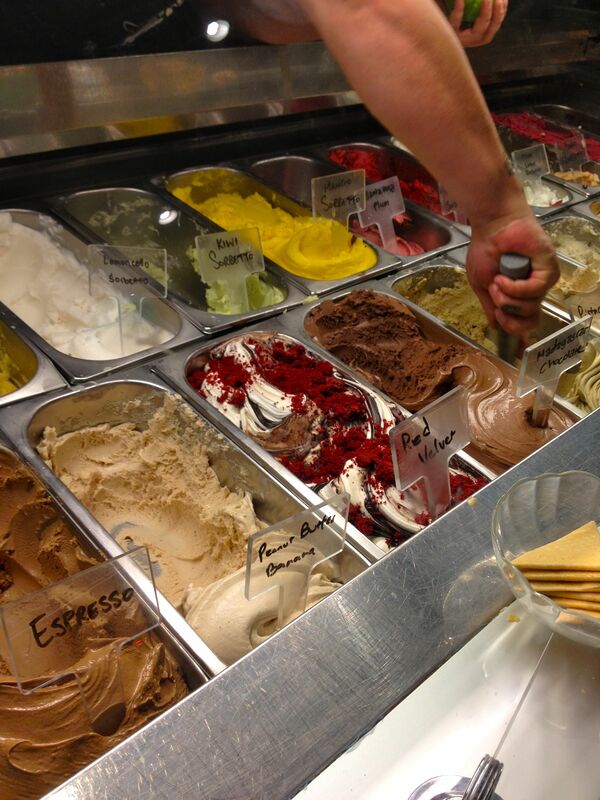 Another frozen dessert I love is gelato! My friends and I often stop by Pazzo Gelato in Silverlake. They use local ingredients and also offer vegan flavors. On the weekends and on hot summer days, it’s not surprise they have lines that go out the door — but the lines usually go pretty fast. My favorite flavor is blood orange sorbet. I love it because you can actually taste the blood orange – it’s not hidden by extra sugary sweetness or icy texture. Their sorbet is flavorful and easily scoops onto the gelato spoons and melts away on your tongue with a tangy aftertaste. When I was there last, I didn’t see the blood orange sorbet and I didn’t know what to order. I stood there… confused and lost. The guy behind the counter said I looked like I was looking for something and told him I usually get the blood orange sorbet. He said he had some in the back and brought it out. That’s service! For real Chinese food in Los Angeles, you head east to San Gabriel Valley. The suburbs in SGV are known for quality savory eats but also dessert. This summer, my friend introduced me to a boba drink with a twist. 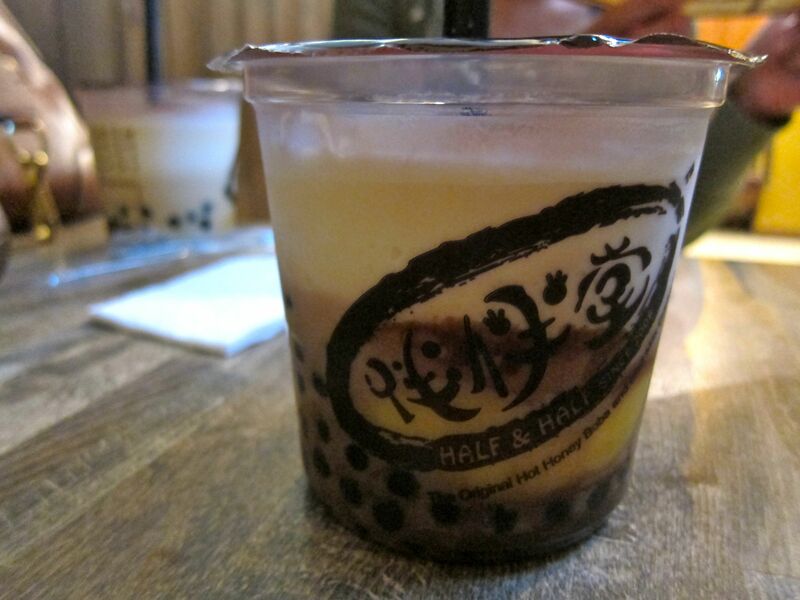 Boba milk tea, also known as pearl tea or tapioca milk tea, is a popular drink in the summer. But at Half and Half, they’ve stepped it up a notch and have made the beverage into a dessert meal. I ordered the iced milk drink with chocolate, pudding, and honey boba. It was intense sweetness. First off, the cup is larger than your regular boba drink. And when you’re slurping the drink and tapioca balls, you’ll also get chunks of rich pudding. If you look closely to the picture, you’ll see yellow chunks – that’s the pudding. I thought my tastebuds would be confused by all the rich sweet flavors but it actually worked out. The chewy honey tapioca balls balanced the rich pudding that balanced the heavy chocolate. Don’t get me wrong, if you don’t like sweet rich beverages, this may not be for you – but if you want to indulge or have a sweet tooth, you must order one of these. This is something I wouldn’t order everyday but it’s definitely something I would have again on a hot day… or just for dessert. If you have a favorite summer treat you’ve had this summer, please share your tip! In L.A., summer doesn’t truly end until October so I’ll definitely need to try other cool eats! I’m going to a 4th of July BBQ and I volunteered to make dessert. I asked if there were any dietary restrictions and my friend said it would be great if I could make something vegan-friendly. I said yes without thinking. But later I realized most of the stuff I make uses butter or eggs so I couldn’t use my go-to dessert recipes. But then I realized, dark chocolate is vegan – just read the label though because some name brands can skimp on the cocoa and add milk… more on that later. I admit I read every bag of chocolate chips in the baking aisle in the store. Interesting bit is that not all semisweet chocolate chips are made the same. The ones that were more inexpensive had some milk or dairy mixed in but the more pricier chocolate chips didn’t and I assume it’s because it had a higher cocoa content. I ended up going with Guittard real semisweet chocolate but the Ghirardelli all natural semisweet also works if you can find it in stock at your grocery store. So you have your goods, now what? Wash your strawberries and dry thoroughly. Lay a clean sheet of parchment paper on a cookie sheet. Get a pot and fill it with water halfway and put it on the stove with medium heat. Get a metal bowl and put it on top. I have a bowl that’s slightly bigger than the pot so it sits nicely on top and doesn’t sink into the water. Don’t use glass or plastic. Put the chocolate chips inside the bowl and get a wooden spoon to stir s the chocolate melts. Use a wooden spoon so it won’t scratch your bowl like metal or plastic spoons. Once the chocolate has melted, turn off the stove and grab your strawberries. Dip your strawberries halfway and swirl in the chocolate. Lift up and let the excess chocolate drop off and place the strawberry on the parchment paper that’s on the cookie sheet. Once you’ve put it there, don’t move it around or you’ll have a chocolaty mess. Once you’re done, let it cool outside for about 15 minutes then put it in the fridge for a couple hours. 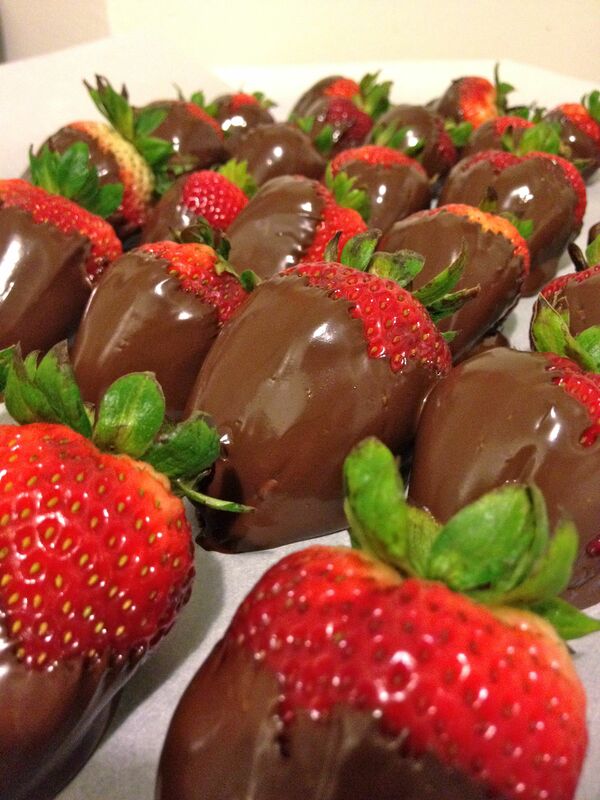 In less than 3 hours, from start to finish, you’ll have your chocolate covered strawberries for your party! Apologies for my long absence. I promise I’ve been filling my belly with good eats but I’ve let you down in documenting my adventures. Last year I changed jobs which was an exhilarating and scary thing for me. Exhilarating because I am growing and learning more with this new change. But it was scary because I had been working for seven years as a public radio producer and I was embarking on something new at a new place. I don’t regret my decision for leaving but as I situated myself with my new work, I had less time for my personal projects – like my blog. But in the last couple months I’ve felt this feeling that I was missing something – I realized it was this… my creative outlet to share my love of food and adventures with you. This note is to let you know that I’m back! My friend had a Blackboard Eats deal she wanted to use at Short Order LA – a gourmet hamburger place that’s a collaboration of Amy Pressman and Nancy Silverton. Don’t be afraid because I wrote “gourmet” – the scene is very casual and I’ve walked by this place many times but haven’t tried it because I often choose the farmer’s market food court on the other side because of the selection and affordability. But like everyone else who is part of the deal craze, we decided to check out the pricy side of life thanks to my friend’s deal. My friend’s deal got us orders of off-the-menu-burgers, fries, and cocktails. It was a beautiful spread as you can see. The burger off-the-menu was the Rocky Mountain Burger that was topped with fried shallots and homemade BBQ sauce. The shallots weren’t overwhelming like onion rings – it’s crispy well-seasoned flavor was thanks to the cornmeal batter . The burger part was a mix of three cuts of beef (brisket, short rib, and flat iron). It was topped with iceberg lettuce, and aged chedder cheese. The BBQ sauce was sweet and tangy and paired well with the fried shallots. 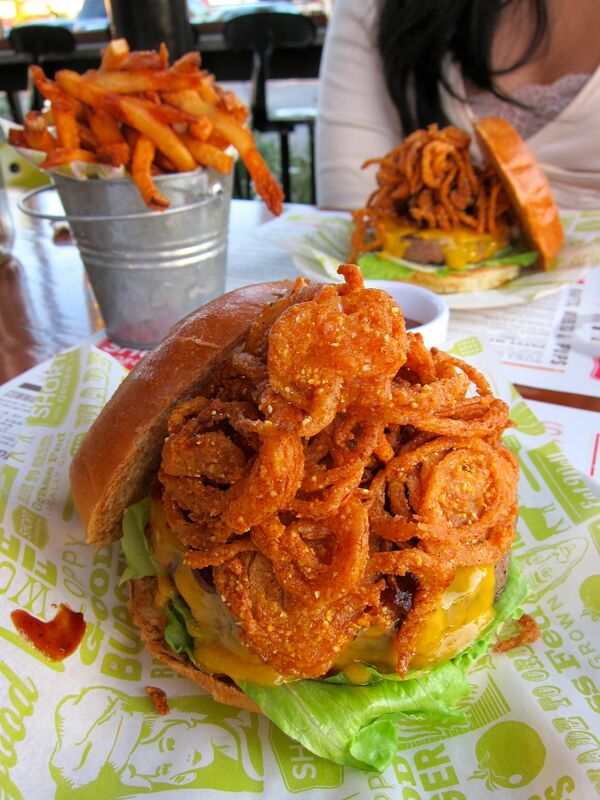 This is definitely a beautiful burger and beyond filling. 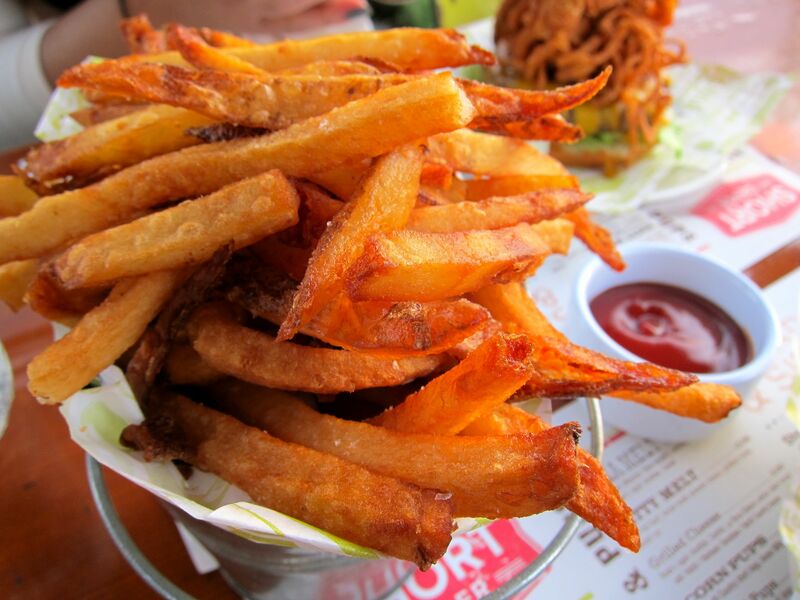 We shared a side of fries and let me tell you, the fries were just right! Served fresh and crisp with the right amount of salt. I admit we did overdo it with the fried food during this meal but don’t fret because we washed it down with cocktails. Here’s my “Blow the Whistle”, which reminded me of a “greyhound,” in the foreground and my friend’s “Frisco Sour” in the background. I admit I didn’t finish my meal because it was all quite filling. I definitely recommend if you head out to Short Order LA, enjoy the patio with some cocktails and appetizers and perhaps split a burger if you don’t have a large appetite. I’m looking forward to going back and trying something on-the-menu next time! I love mochi. I love the soft bite-sized rice cakes sprinkled on my frozen yogurt. The taste of the traditional Japanese mochi filled with red bean reminds me of my childhood – my parents would buy it all the time. 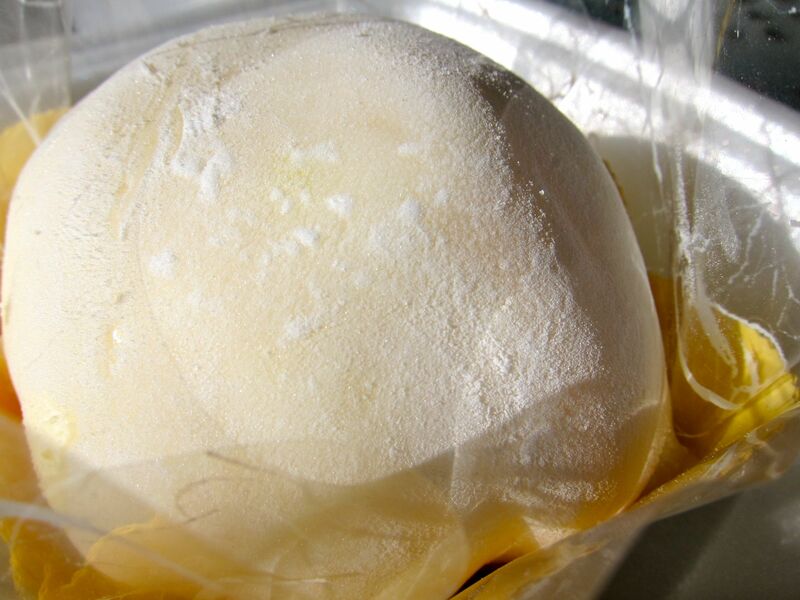 And of course mochi ice cream… whether it’s green tea, mango, or strawberry, I will devour it in one bite despite the fact that I’ll get brain freeze. Yum! So I couldn’t help myself when my friends showed me the Mango Mochi Ball at the Irvine Taiwanese bakery, J Sweet Bakery. They had tried it before at a different bakery but not at this one. We couldn’t help ourselves and each ordered one. The size is 2-3 times larger than the traditional Japanese mochi. Also, it’s shape is closer to the dome of an airy steamed bun. 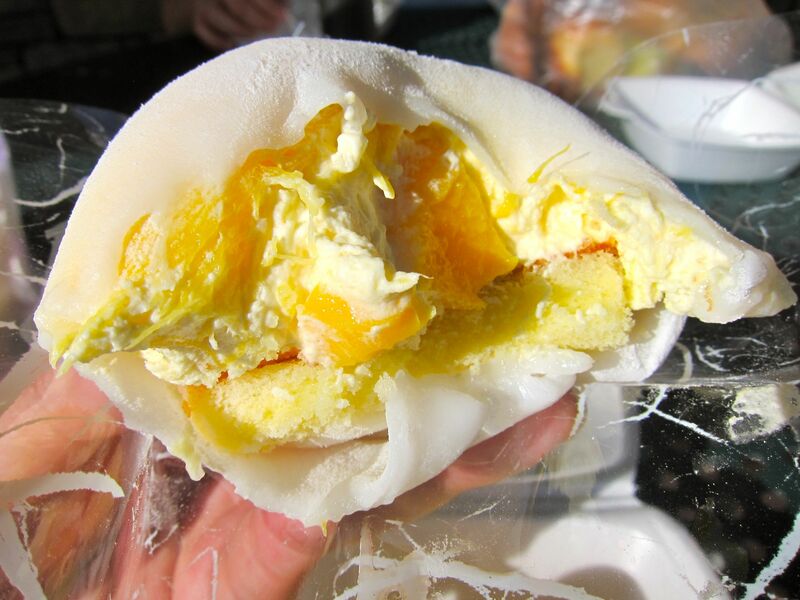 The mochi is pillowy and airy and surrounds the outer layer of the Mango Mochi Ball – which is as soft as marshmallow. When I take my first bite, it feels like I’m biting into a mango cloud! Inside the layer of the gooey rice cake is a layer of sponge cake and at the center is a mango mousse with fresh bits of mango. The overall flavor is subtle and fragrant. Bit of advice, if you eat this, don’t pick it up with your hands – pick it up with the cellophane or the wrap it comes it because the warmth of your hands will make the mochi stick to you and it will get very messy. Cooking seasonally comes easy because there are so many great fresh vegetable recipes out there. But baking (more specifically cookies) can be a bit hard. Often times, recipes ask for dried fruit. Right now, strawberries are in season and I’ve been scouring my cook books and the web for a recipe that called for fresh strawberries – not as a cream or preserve for a cookie sandwich or dehydrated bits but actually integrating strawberries into the cookie. 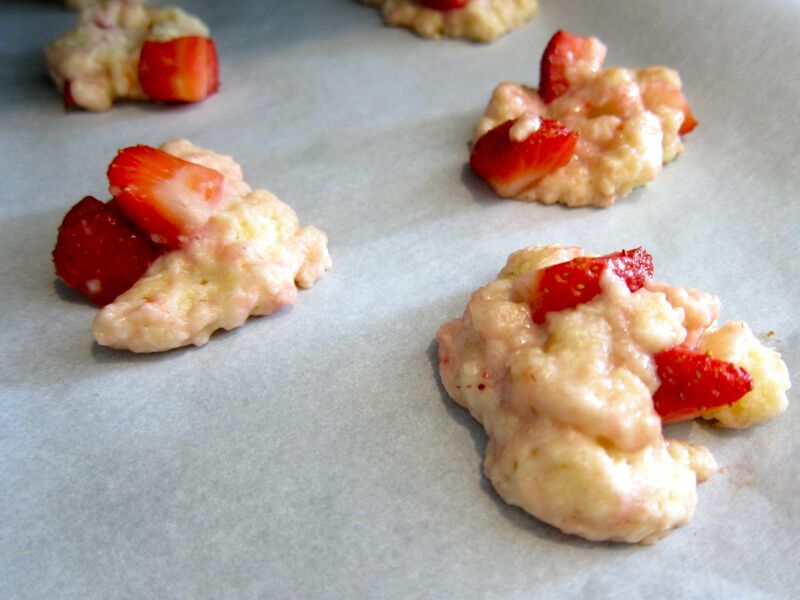 I ended up finding this simple recipe by Martha Stewart for Strawberry-Shortcake Cookies that used fresh strawberries. I thought it would be perfect for a potluck I was going to. I bought some fresh local strawberries – pick a package with smaller strawberries because they tend to be sweeter than large strawberries. You know when it’s ready because the edges are slightly brown and the strawberries keep their shape. 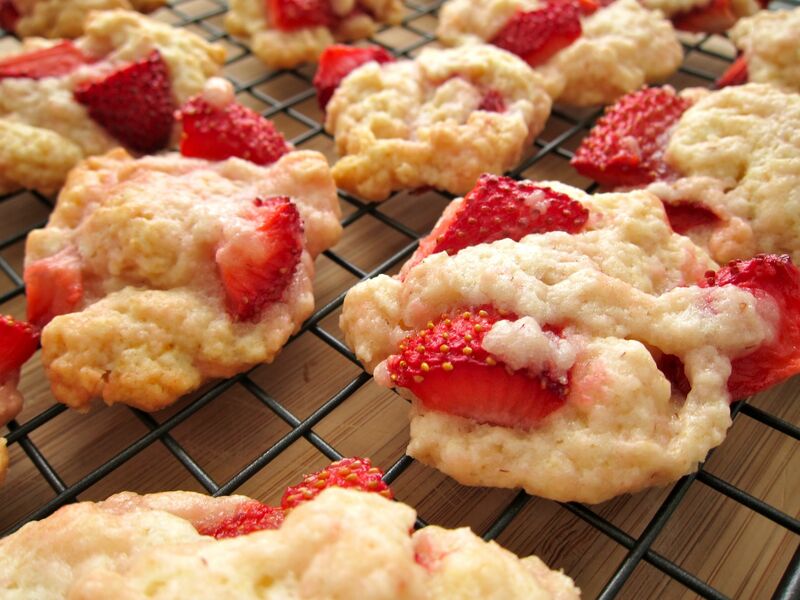 These cookies should be eaten in 24 hours because you don’t want the strawberries to dry out. I brought them to a potluck dinner and they were all eaten. Can’t wait to make these again!